Myotis has a home! 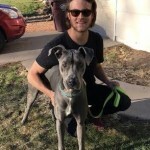 - Rocky Mountain Great Dane Rescue, Inc.
Myotis has a home with her new family in Denver, CO! Myotis will be Keegan’s first Great Dane and he is over he moon excited to bring this sweet and beautiful girl into his home. Keegan is an outdoorsy guy and wants to take Myotis with him on walks, runs and hikes into the hills. Myotis will be an only dog who is going to be spoiled rotten with love! Keegan works for a dog-friendly company…so this gal will be able to go to work with him. LUCKY DANE! Keegan has affectionately renamed her to Luna! Way to go sweet girl.